The embedded librarian program is an integrated library service to help support the research process. It is a proactive strategy to incorporate information literacy into the learning process and places the library where the students are. Using the embedded librarian program is a great way to extend students' access to research assistance after an information literacy session and provides more consistent and personalized assistance for your students. An embedded librarian is especially useful for online classes or ones that involve a research component. This program is a partnership with faculty that will integrate the library into the curriculum and work together towards a solution to an information problem. I can be as active in the course to the extent the faculty member prefers. 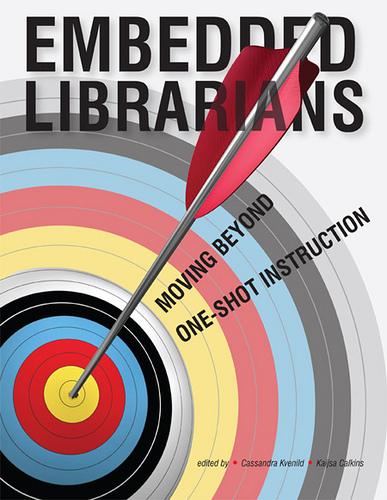 Do I need the Embedded Librarian Program in my class? Do students need help identifying a type of research (peer-reviewed, primary vs secondary)? Do students need help narrowing a research topic? Would you like your students to move past Google and be able to find and use authoritative, scholarly sources? Would students benefit from knowing which of the 70+ available databases are best for their project? Would students benefit from being able to contact the library right from the IvyLearn classroom? Add library contact information to the IvyLearn classroom allowing students to contact the library directly from the classroom. Create a reading list (bibliography) from library resources as a supplement to or replacement for a textbook. (Also available in PDF). Create a course Library Research Guide that provides sample keywords and searches to help start the research process. Create assignment and subject specific announcements to the IvyLearn classroom that help with research, promote library resources, critical thinking skills, and use of citations. Create a subject or course specific guide that can be linked from the IvyLearn classroom. This guide can contain articles, videos, and books from the library collection, subject specific websites, OER resources, and tutorials on how to use databases. Provide in person or online research consultations with students to help narrow topics, brainstorm ideas, identify keywords, provide database guidance, and answer citation questions. This can be a mandatory or voluntary part of the class. Create pre and post-tests to assess research skills. These can be extra credit, mandatory, or voluntary.